Inksters participated in the Barnardo's Free Will Scheme. With almost half of Barnardo’s income from the general public being donated through wills, Barnardo’s joined forces with Inksters in 2010 - 2012 to offer a free will writing service for those aged 55 years and over. "These donations are our lifeblood and make a huge difference to the vulnerable and disadvantaged children and young people who we work with." Inksters were one of 40 solicitor firms throughout the UK to offer this service but the only one to do so in Scotland. Inksters were also the first of those 40 firms to write a will for Barnardo’s. 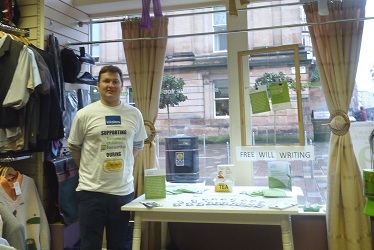 Inksters set up a pop up kiosk in a Barnardo’s shop in Glasgow in September 2011 during ‘Remember a Charity’ week. This created an approachable and accessible way for members of the public to speak with Inksters’ staff about making or renewing their Will. The kiosk was manned by Inksters’ Iain Witheyman (wearing a specially printed Inksters + Barnardo’s Remember a Charity week T-Shirt) for about 20 hours between Monday and Saturday (inclusive) and generated 20 committed will enquiries and a further nine possible ones. The initiative was accompanied by a week-long Twitter campaign that generated fresh enquires about will-writing from across Scotland. "I have been thinking about making a Will for a long time but have just kept putting it off. I even bought a Will pack from the Post Office but it has just lain in a drawer. This [Kiosk] is a great idea, it has made [organising my Will] really easy, I will be so glad to finally sort it out." "The Inksters experiment is an example of how law firms can, with only a small investment, bind themselves more closely into their local communities. I always use the example of my village summer fair, attended by hundreds of local residents and several local businesses, such as estate agents, but never a law firm. Mr Inkster has potentially gained a lot of new business by going to the clients, rather than waiting for them to come to him. Access to justice is not just an abstract concept – it means physical access too." The Barnardo's free will scheme is no longer available in Scotland. However, to discuss your will making requirements please Contact Inksters.